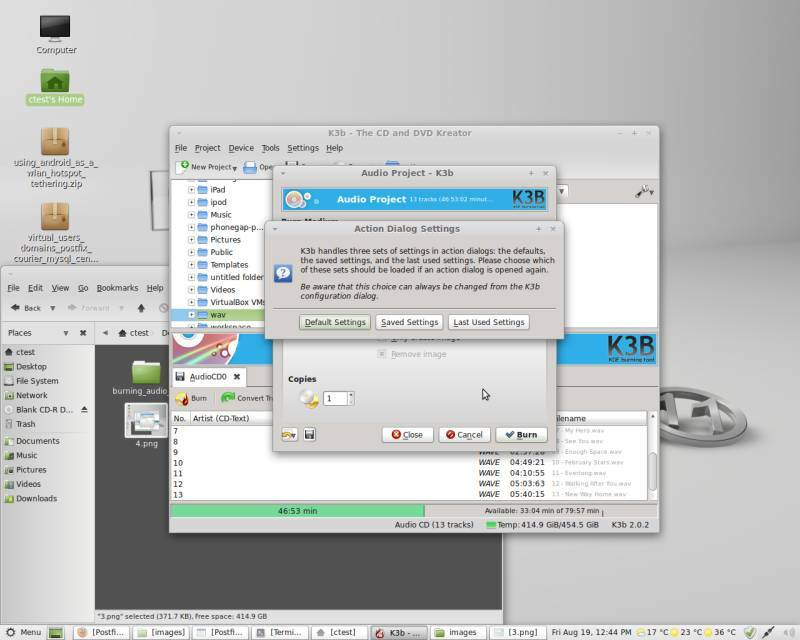 This article is about how you can convert your mp3 audio files to a format accepted for burning audio CDs and burning them on a blank CD afterwards on Linux Mint 11. There are multiple ways and applications to convert and burn your audio files, however the ones I use happened to produce no problems that others did, e.g. inflating the size of the produced .wav file so greatly that a 13-track album would not fit on an ordinary blank CD. If other applications cause you no problems, you can also use those instead. The most common format to store and listen to audio files is mp3, since its only losses are those not noticable to the humen sense of hearing. Most CD players however do not recognize CDs that contain mp3 files and therefore we first must convert the mp3 files to .wav format. If you already store your audio files as wavs, skip this step and proceed to burning (and maybe consider converting your files to mp3). 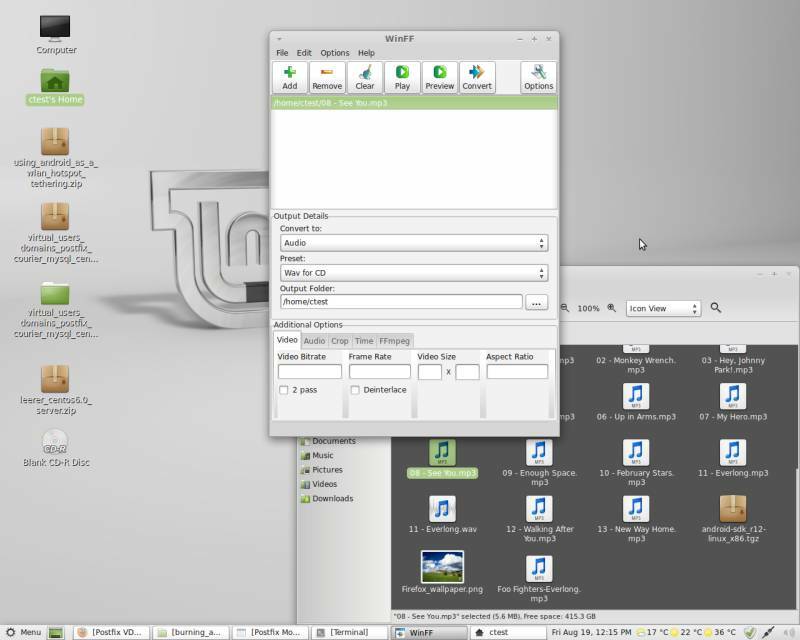 In the main window, just drag and drop one or more audio files to the white input panel or add them by using the Add button. Select Audio in the Convert To... dropdown menu and Wav for CD in the Preset dropdown menu. You can also configure the directory the output files will be saved in. After you are done, press the Convert button. The files can then be found in the selected output directory. In the main window, select New Audio CD Project. Browse the converted .wav files, select them all, right-click and choose Add to project. The files will then be listed in the panel below. Should you try to add files with a non compatible format, you will get error messages and the files will not be added to the project. Click on Burn afterwards. The preferences in the next window should all be correct for our purposes. Make sure the empty CD is selected as medium to write on. Proceed with Burn. Select Default Settings if you have not made any before. The burning process will begin afterwards. The disk will be ejected automatically after the process has finished. Click on Close to exit the setup. 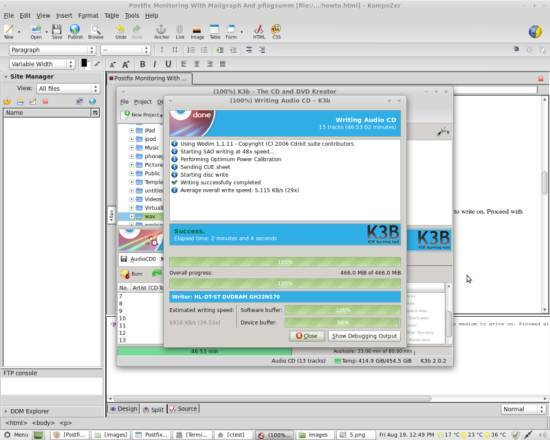 You can discard the unsaved settings that you are told about when exiting K3b. Enjoy your copied audio disk in any CD player! It is unnecessary to convert the audiofiles to WAV as k3b will do this for you for the most common formats (mp3, ogg, flac, ...).